The RF IDeas family of card readers offer plug-n-play functionality that eliminates the need for manual entry and provides error-free identification. The USB models emulate a keyboard and keystroke the card’s ID and/or site code to the cursor’s location on the screen. The reader can be configured to add keystrokes before and after the card’s data. The serial versions, available in RS-232, Ethernet, or USB Virtual Com, deliver the card’s data in ASCII. In addition to the standard housing, readers are available in USB Dongle, PCMCIA, kiosk/wall mount, embedded keyboard, and OEM form factors. To help integrate with applications RF IDeas offers optional Software Developer’s Kits (SDK), for both pcProx and AirID. pcProx is compatible with over 300 million physical access 125kHz proximity cards. These readers allow users to use their building access card for other forms of identification and security throughout their workplace. AIR ID is compatible with nearly all 13.56 MHz contactless cards/tags/labels. Like the pcProx readers AirID readers allow users to use their building access card or other 13.56 MHz tags for other forms of identification and security throughout the workplace. 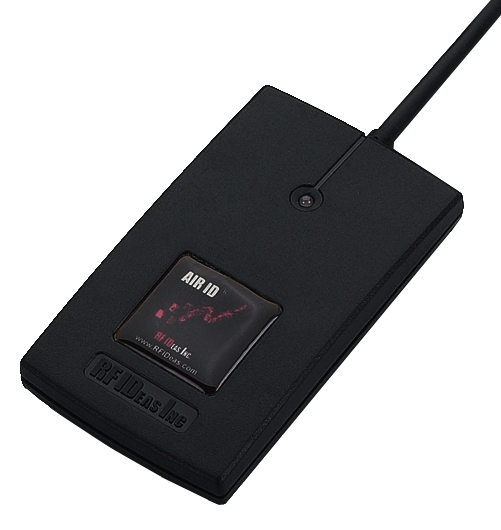 The plug-n-play reader comes with flash memory, allowing the user to quickly configure the output to meet the user's needs. The pcSwipe reader is compatible with the billions of magnetic stripe cards in circulation worldwide. the pcSwipe has been designed to meet the identification and security needs of customers in many different applications and environments.The pcSwipe can be used as a standalone system, or can be integrated with other software applications using an optional software developer’s kit. Not sure of the card you are using RF IDeas has introduced the Card Analyzers. These Card Analyzers help users, solutions providers, and hardware/software integrators quickly and accurately determine what card technology is currently in use.